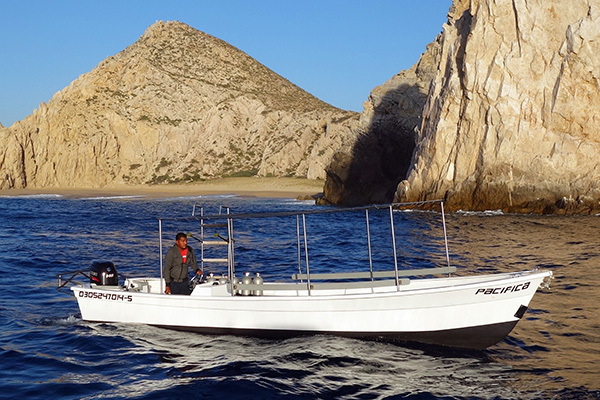 Our 40 foot “Sunshine” was purpose built for the sea condition in the eastern pacific and Sea of Cortez and as a result she can handle all varying weather conditions and offer a smooth and comfortable ride. The “Sunshine” is powered by 2 outboard engines and has a marine head onboard. This vessel is set up for 12 divers + crew. 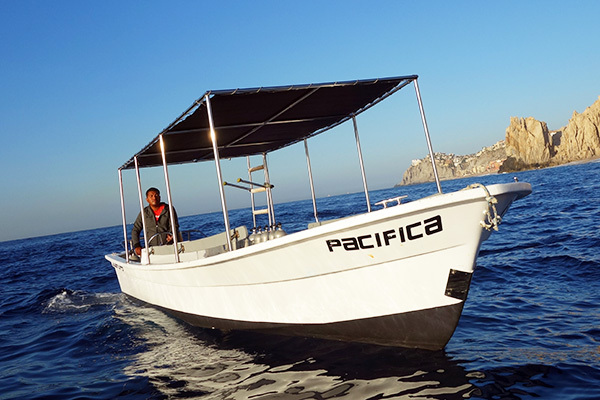 Our 26 foot “Pacifica” was locally build in La Paz, Baja California Sur. The shape of the hull cuts nicely through the waves and is powered by a new 140 hp Suzuki outboard. This is the perfect boat when you like to get to the dive sites fast. The capacity of this boat is 6 divers + crew. 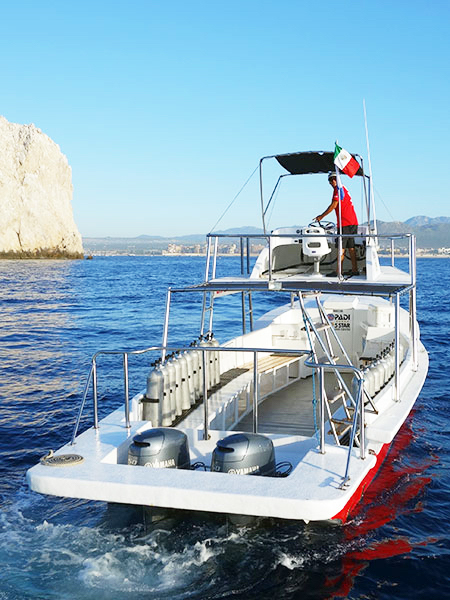 Our customized dive boats provide plenty of shade. There are tank racks onboard as well as a large dive ladder and dry storage for your personal belongings. More importantly our dive boats have all necessary safety gear available on board like, life vest, emergency oxygen equipment, first aid box marine radio, GPS etc. 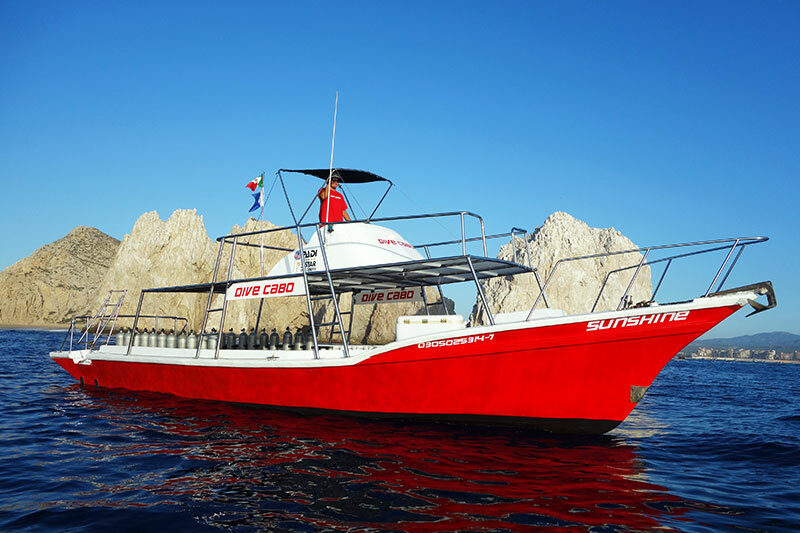 Our dive boats are located inside the Cabo San Lucas marine only a 3 minute walk away from our dive shop. Check in is at our dive shop either at 8:15 am or are 1:30 pm. Most dive sites are between 5 – 40 minutes away by boat. Only Gordo Banks is 1.5 hours away by boat. Free bottled water and snack are available on our dive boats so you only need to bring towels and sunblock. For the cooler month like January – March we also recommend bringing a wind breaker or hooded sweater.